How do you feel about cooking? Is it a daily joy you love…or a daily chore you loathe? It doesn’t matter how you feel about cooking - with CorningWare in your kitchen, cooking is a breeze! If you love to cook, then you’ll be amazed by the delicious meals you can create with CorningWare. 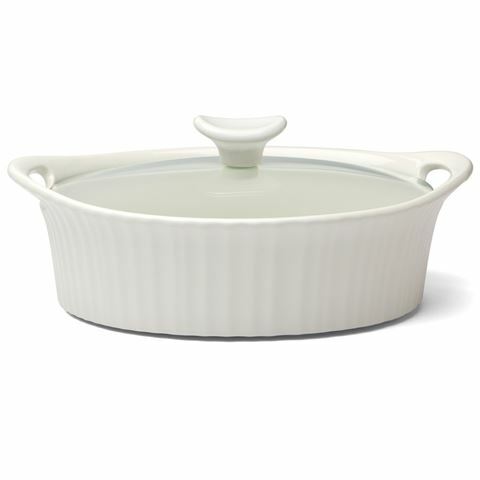 If you’re not a big fan of cooking…then you’ll be wrapped with the way CorningWare makes cooking so easy. From the oven, to the table, to the freezer, to the microwave, and finally to the dishwasher, CorningWare looks after every meal from start to finish. And there’s nothing it can’t cope with. CorningWare is reliable, strong, efficient…and, of course, stylish. It’s just the thing everyone needs…even those who aren’t too enthusiastic about cooking. Let CorningWare help you learn to love your kitchen! Lid made from duable Pyrex. Oven, freezer and microwave safe. Recommended for use with nylon, plastic or wooden utensils. Dimensions: 21.8cm (l) x 16cm (w) x 5.8cm (d).